Recent coastal storms have revealed the signatures of World War Two soldiers etched into Norfolk’s sea defences. 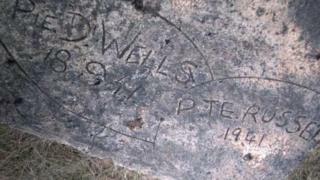 The names of Pte Wells and Russell were scrawled on concrete anti-tank blocks on Winterton beach, dated 1941. The soldiers are thought to have helped put the original defences in place more than 70 years ago. “It’s a piece of oral history. It’s very important to people around here. The war was a time of real drama,” said local historian Andrew Fakes. The 13-tonne blocks were originally put in place in 1940 to stop enemy tanks coming ashore and were arranged in ranks along the beach, according to the Pillbox Study Group. Nowadays they protect the coastline from erosion. Studies show that Winterton Gap was watched over by a platoon from the Royal Berkshire Regiment, although it is not known if the soldiers in the etchings belonged to it. Winterton’s proximity to Great Yarmouth made it attractive to invaders as a way of attacking the port from the side. A blog on the Winterton village website said: “Who would have thought that when Privates Wells and Russell gouged their names into the surface of a huge concrete anti-tank block on Winterton Dunes their handiwork would be considered important. Mr Fakes said the blocks were a modern symbol of war but still held a certain charm for beachgoers. “If we were talking about a Martello tower or a castle everyone would be fascinated,” he said.